The United States has had a long history of agricultural guest worker programs used to import workers when needed, for example, during labor shortages or wars. 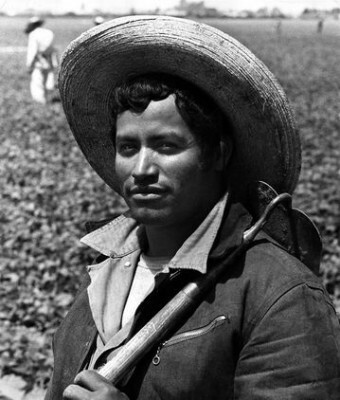 The first agricultural guest worker program was called the Bracero program. It was initiated in 1942 to import workers from Mexico to temporarily fill the United States’ labor shortage during World War II, and was terminated in 1964 due to worker mistreatment. Wages and living conditions were kept low by employers and the U.S. Department of Labor officer who headed the program, Lee G. Williams, described it as “legalized slavery”. Many former Bracero farm workers are still fighting to collect wages (an estimated total of $500 million), that they were promised upon their return to Mexico. The Bracero program was not the end of guest worker programs in America. Our current guest worker program for “low-skilled workers” grants seasonal agricultural visas, or H-2A visas, which allow employers to hire workers from abroad on a short-term basis and grant them temporary immigration status. H-2A workers represent less than 2% of U.S. farm workers, but their numbers grow every year. Guest workers come from many countries, but mainly from Mexico. The current H-2A program is controversial. Although the protections, benefits, and worker conditions for farm workers should be improved, the program provides workers with a legal pathway to work in the United States while providing the agricultural industry with a much-needed workforce. How do workers find out about the H-2A Program? Almost all H-2A employers use recruiters based in other countries to recruit workers. Recruiters may look for workers by advertising throughout their community. In order to legally migrate to the United States, some workers will find recruiters themselves. The H-2A program has been extremely profitable for companies and recruiters who often charge thousands of dollars in recruiting, visa, and travel fees for job placement in the United States. Profiting from recruiting has been illegal since 2008, yet persists due to the lax enforcement of U.S. laws that protect workers during the recruitment process. Workers will take out high-interest loans and/or provide collateral, like home deeds, for a chance to secure a job. Farmers and companies are hiring an increasing number of H-2A workers. Employers may view the H-2A worker as an alternative source of cheap labor: a source that eliminates the risk of hiring undocumented workers. The majority of H-2A workers are hired by full-time growers and large-scale farms in the southeastern United States. There is a shortage of U.S. workers: there are not enough qualified, willing and abled U.S. workers available for the job. Employing H-2A workers will not adversely affect wages and working conditions of U.S. workers doing similar jobs. The job advertised is temporary. There are many benefits for employers who hire guest workers. For example, employers do not have to pay Social Security or unemployment taxes, as they are required to do for domestic workers. Employers may also choose their ideal workforce, usually single young men, because U.S. anti-discrimination laws do not apply to foreign workers. They can reject workers who seek higher wages or benefits and hire workers who accept less. Once an employer hires H-2A workers, they are unlikely to go back to hiring domestic workers. Current protections for H-2A workers include provisions on how to set worker wages and a guarantee that employers will provide the workers at least three fourths the number of work hours originally offered, or pay for any shortfall. Legal protections also state that workers that complete half the season with an H-2A program employer must be reimbursed for the transportation and subsistence costs associated with traveling to the place of employment. Those who complete the full season must receive subsidized transportation home. In terms of housing, employers must provide housing for their workers at no cost. The housing must meet federal and state safety standards. Finally, employers that solicit H-2A workers must provide workers’ compensation insurance for occupational injuries. Employers are not obligated to offer or provide health insurance or to pay Social Security or Medicaid to H-2A workers. There are also many flaws to the H-2A program. Since the hiring process of H-2A workers takes place outside the United States, employers can circumvent U.S. regulations that prevent discrimination practices. There is also an issue with housing. Although growers are obligated to provide free housing for workers, it is typically substandard, overcrowded, and in some cases, even squalid. Worker housing is often located in remote rural locations; inspections are lax and sometimes occur only once – before workers move in. Additionally, the most fundamental protection offered by a free market system, the ability to change jobs, is denied to H-2A workers. A worker on an H-2A visa can ONLY work for the employer who petitioned for them to come to the United States. If they do not receive what they were promised, or are otherwise exploited, workers have few options but to go back home. If they violate their contract in doing so, they must pay for their own transportation. These conditions decrease the likelihood of guest workers reporting irregularities related to their wages, working conditions, or safety, because doing so could threaten their job. 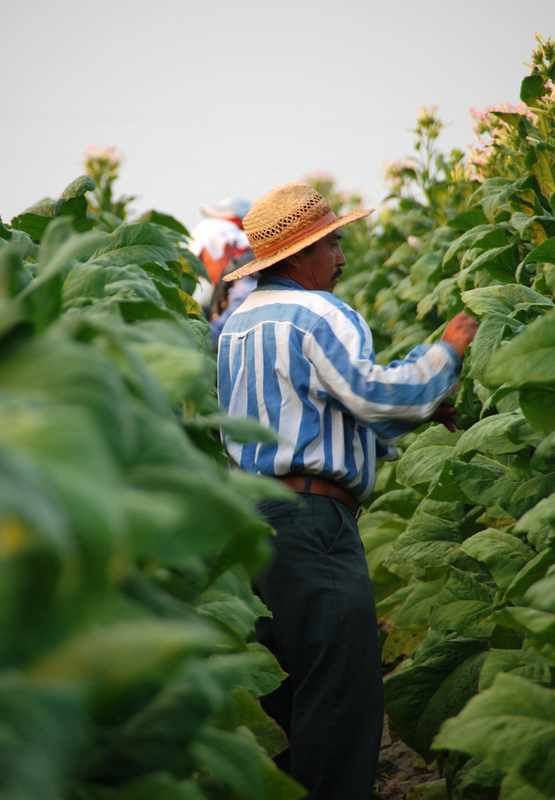 In many cases, workers have no contact with anyone besides the grower or labor contractors. Workers rely on their employers for transportation anywhere. This extreme power imbalance also leaves workers with little agency to report abuses or fight for the rights to which they are legally entitled. Workers who do fight for their rights can be blacklisted, preventing them from being hired in the future. Some of the worst cases of H-2A worker abuse have involved fraud and human trafficking. YAYA supports farm worker organizations that are fighting to improve the working conditions for guest workers. FLOC: In 1998, the Farm Labor Organizing Committee (FLOC) began organizing farm workers in North Carolina. After a 5-year boycott of Mt. Olive Pickles, FLOC and the North Carolina Growers Association signed contracts that protected workers who harvested pickles, sweet potatoes, tobacco, Christmas trees, and other crops. 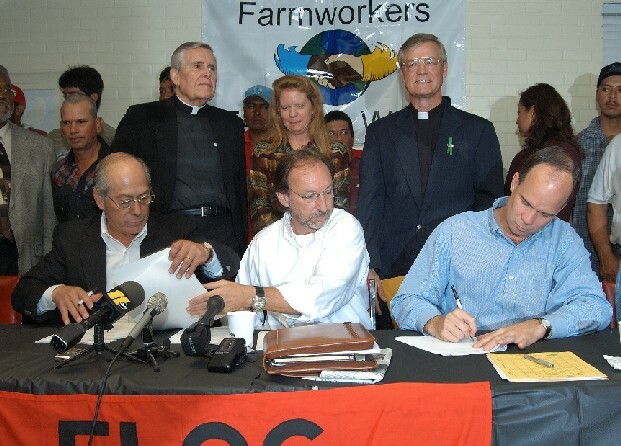 These contracts made labor history by including protections for H-2A guest workers. Formerly, H-2A workers had little say regarding recruitment fees, work conditions, or who employed them. Now, through their union, they are directly involved in labor negotiations, grievance procedures, and building structures to address issues such as health care, immigration policies, and transportation from their home areas in Mexico. FLOC also works on guest worker recruitment, education, and training in Mexico. CITA: The Independent Agricultural Workers’ Center (CITA) serves as a “matchmaker” between prospective Mexican guest workers and U.S. growers. They help workers on both sides of the border; in Mexico they help with the recruitment process, and in the United States they assist with disputes between workers and growers. CITA hopes to provide an alternative source of financial income that could be used to develop the migrant sending communities. Equitable Food Initiative: NFWM is a founding member of the Equitable Food Initiative (EFI), a multi-stakeholder initiative made up of farm workers and growers, environmental and food safety organizations, and representatives from the retail and food service industries. EFI has developed standards in the areas of farm labor, pesticide use, and food safety. These farm labor standards include vital benchmarks for the recruitment and treatment of H-2A guest workers. Support organizations that are working to improve the H-2A program and that are organizing guest workers. Work in solidarity with the people in the Global South to improve the social, political, and economic conditions in their home countries. The H-2A program should be seen as a labor option, but not as people’s only choice to make a living. Work to pass a fair immigration reform bill so that farm workers who are here as well as future guest workers will live with dignity and justice. Develop friendships and relationships in solidarity with guest workers who are often isolated and lack access to transportation.